How's everyone doing today? I can't lie, I'm really excited for the weekend, but not for the same reason as the other 90% of America. My parents are finally home after three years out of the country and the whole family is getting together on Sunday. They don't have a TV after being gone so long so we will definitely not be watching the Super Bowl. The only reason I'm even a little disappointed is because this is the only Sunday of the year when I can do my grocery shopping in almost completely deserted stores. Clearly I'm not much of a sports fan. If you love football which team will you be rooting for? Now, on to the nails. I painted some random doodles over my base of Victoria's Secret, Break the Rules using Maybelline's Bold Gold. 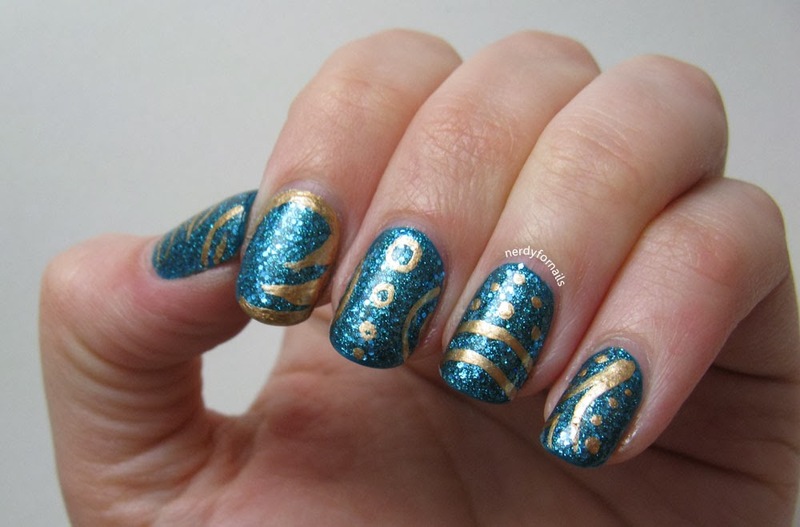 This gold is wonderfully opaque and gives a nice contrast against the teal glitter. I just don't love all the patterns I drew. The glitter was so pretty on its own I almost instantly regretted painting over it. The leaf on my thumb was my favorite design. I'm making a note for my future self. What is it about short weeks that actually seem longer? I had Monday off for the holiday and the rest of the week has been extra hectic. I think everyone saved all their crazy up and made sure to unleash it over the last four days in concentrated form. The stress has sent my brain into overdrive, but I've come up with all kinds of ideas for manicures and franken polishes. Hopefully you'll enjoy the results over the next few weeks. 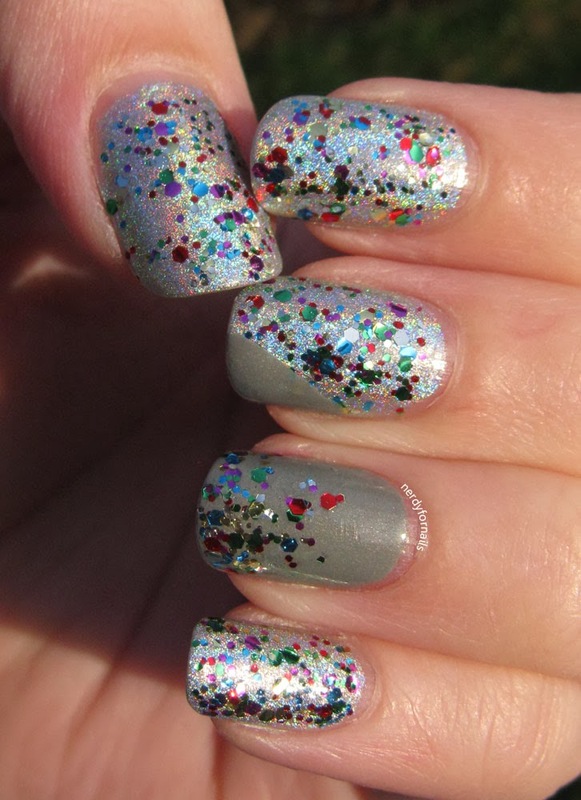 The polish I have for you today is extra sparkly and fun with a hint of crazy to go along with the rest of my week. It was so bright that the camera wouldn't even focus on it correctly! I got some pictures out in the sun that really capture the sparkle. While the rest of the country is buried under a snow storm we broke records today at 76 degrees here in CA so there's not shortage of sunshine for great pictures. I think the brand of this polish is a bit of a surprise, at least it was to me. Every year for my birthday I get a $10 off coupon from Victoria's Secret. I don't really need anything there at the moment, but I can't let a coupon that good go to waste and I knew they had polish so off I went. The last time I was there the polish was all pretty ordinary- nothing to get too excited about. This time two colors really caught my eye. 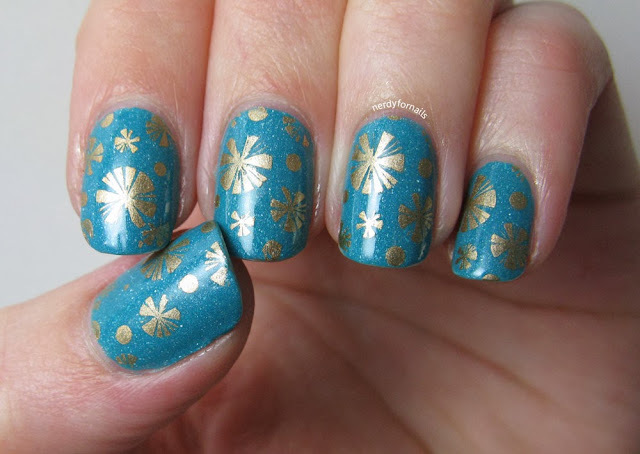 I got this gorgeous aquamarine glitter called Break the Rules and a similar gold glitter called Runway Angel. I'll let the pictures speak for themselves. 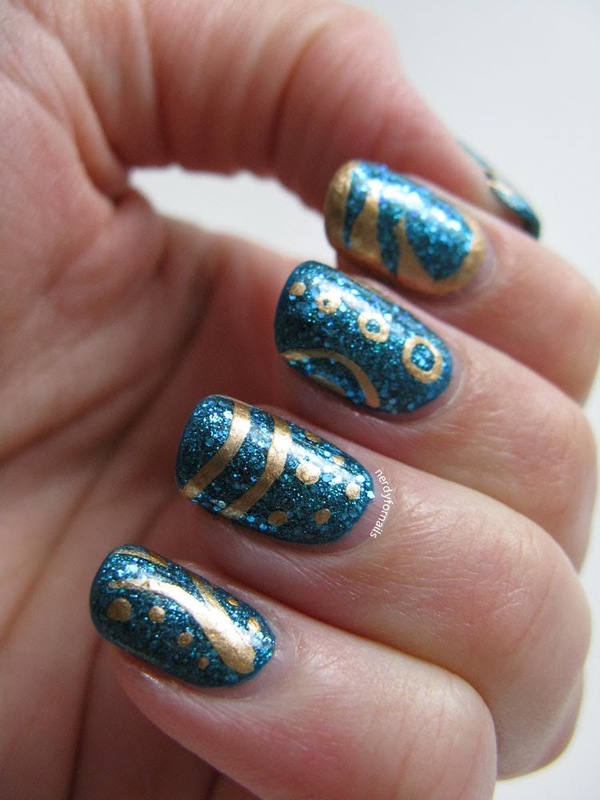 I used one coat of Orly, Teal Unreal as my base topped with three coats of Break the Rules. 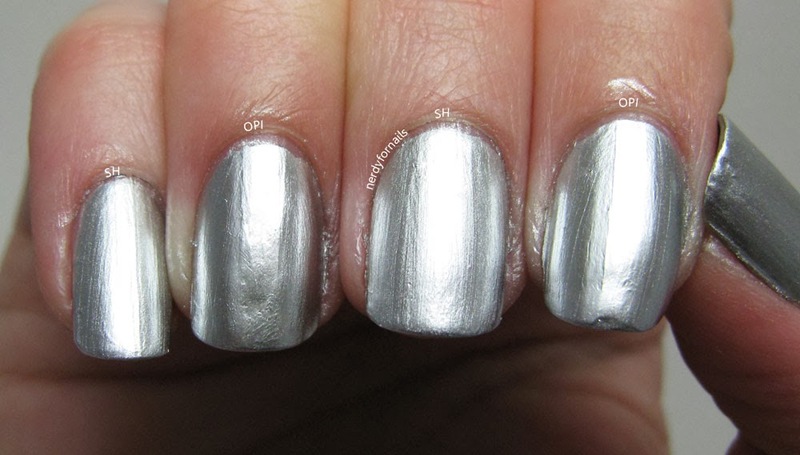 It had really nice coverage with one and two coats, but I wanted more and it paid off. The formula was nice, but it did show wear a little fast. 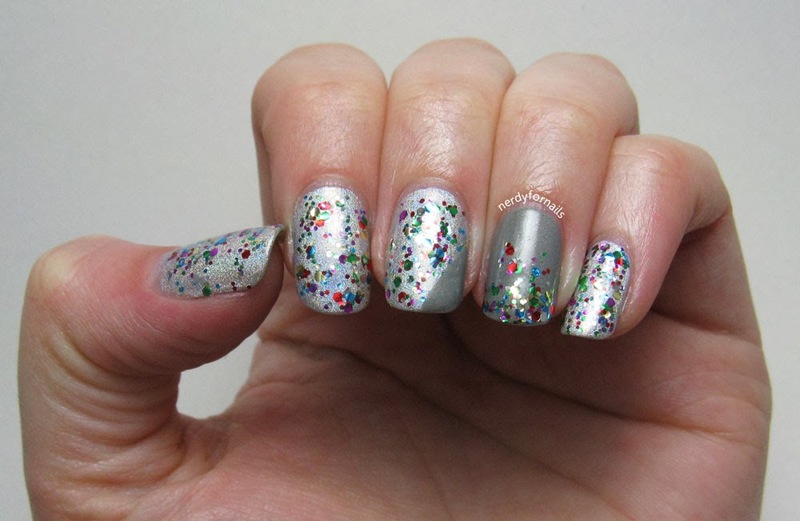 I think glitters can be brittle that way especially with all the extra coats so it wasn't a big deal. 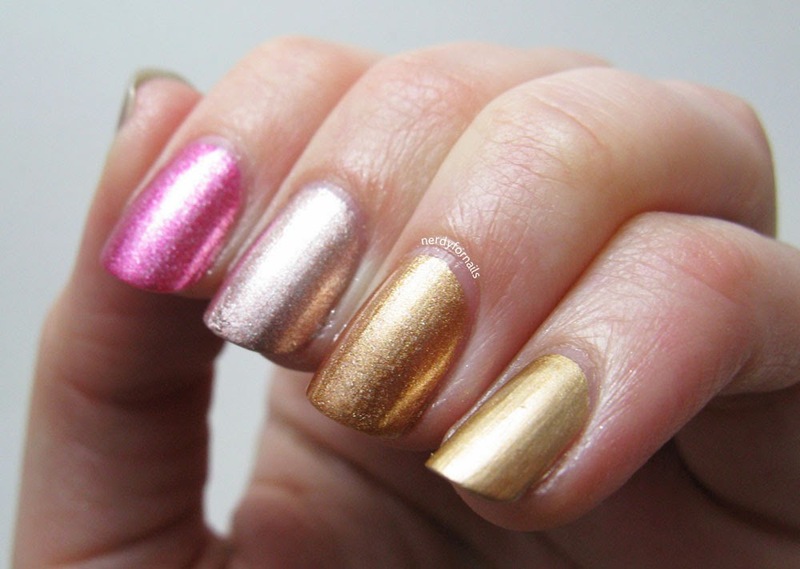 I'll definitely be wearing this again and keeping an eye out for more great polish at VS.
Today I'm giving you guys a peek into my little corner of the world. I'm always curious about how everyone else has their nail stuff set up so I thought I'd share mine. I recently outgrew my helmer and the apartment I share with my husband is pretty small so out of genuine concern for him I got a melmer so my stuff can stay neatly contained. I'm sure it had nothing to do with this post by Refined and Polished about cute decorated melmers. I got my helmer a little less than a year ago and I had all my nail art supplies in three of the drawers so there were only three more left for polish. Not nearly enough room. Now all my supplies are in the melmer so I have a lot more space to organize my polish into categories in the helmer. All my cotton balls and acetone bottles fit nicely on top too. It was really easy to decorate the melmer. I got some scrapbook paper from Michaels for about 20 cents per sheet. 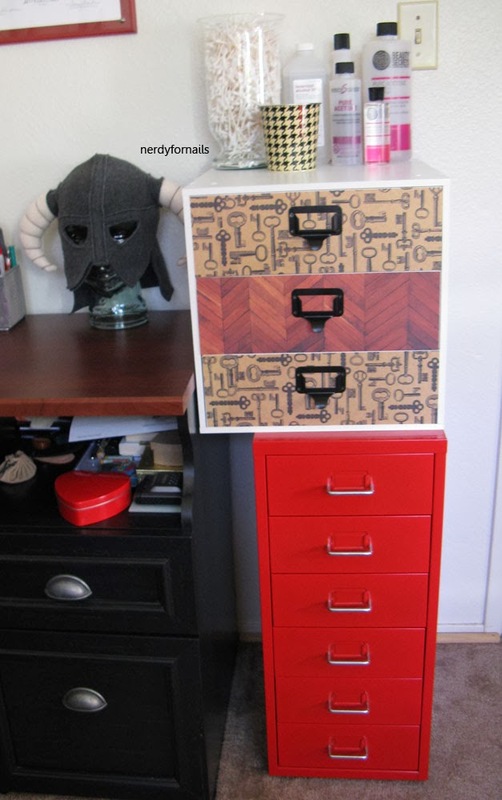 After I trimmed the sheets to fit the drawers I stuck them on with double sided tape. So far it seems very durable since the tape is right up against the edge of the paper. I was afraid it would start to wear and peel off, but it seems to be adhered well enough to avoid that. 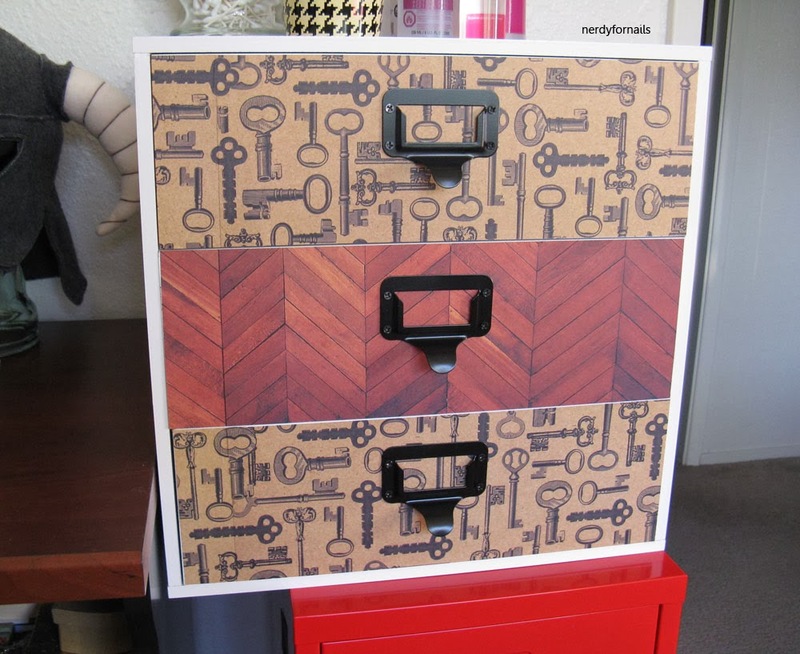 It's a very affordable way to decorate and if I change my mind about the designs later it'll be really easy to change. I also spray painted the handles and screws black because the silver finish didn't really go with my paper choices. 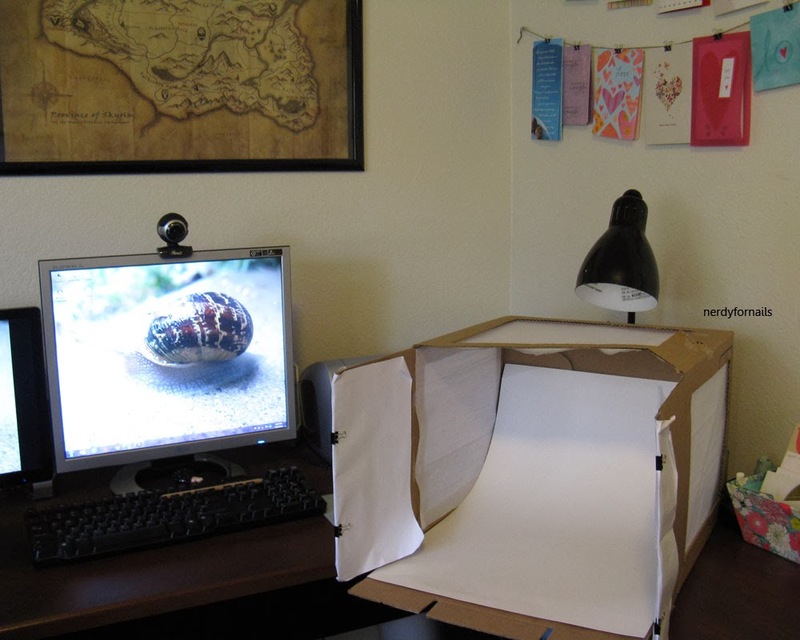 And here's my light box. 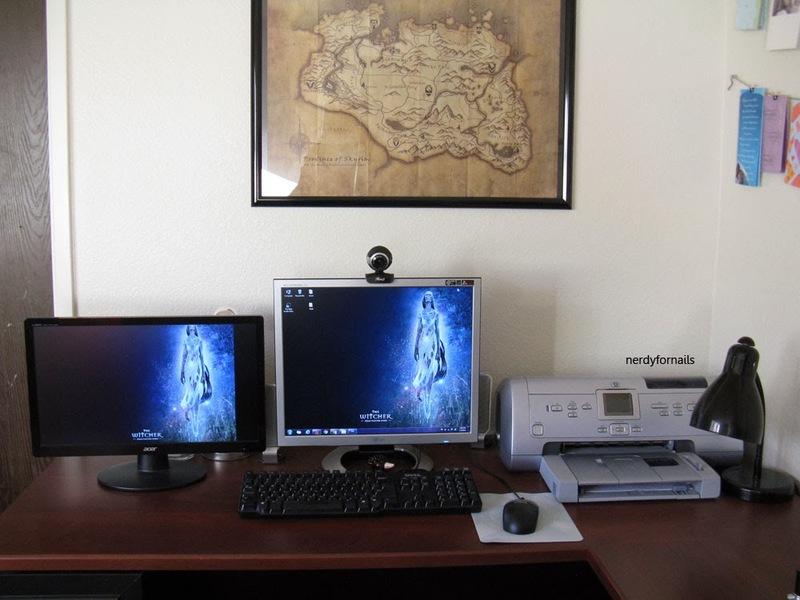 I'm all about blogging on the cheap so of course it's homemade, but I think it works great. 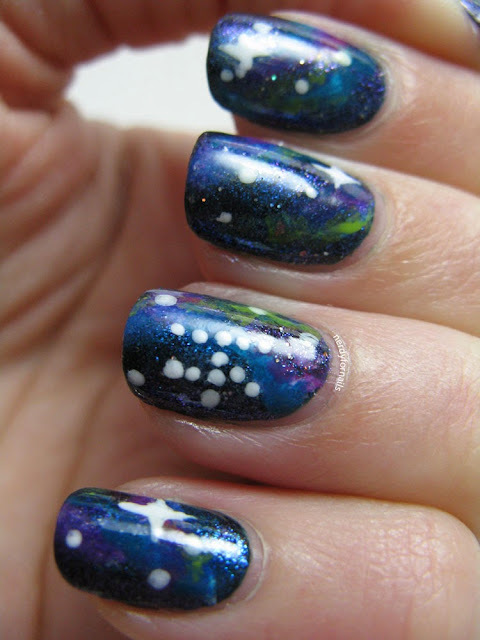 If you're interested in making your own check out this tutorial by Sarah at Chalkboard Nails. It's looking a little sad at the moment because my terror of a kitty went all Godzilla on it a while back. He jumped through the tissue on the top and started tearing large chunks out of the cardboard before I noticed. Cats. Speaking of... this is my cat Styx (I call him Mr Stickers for short). 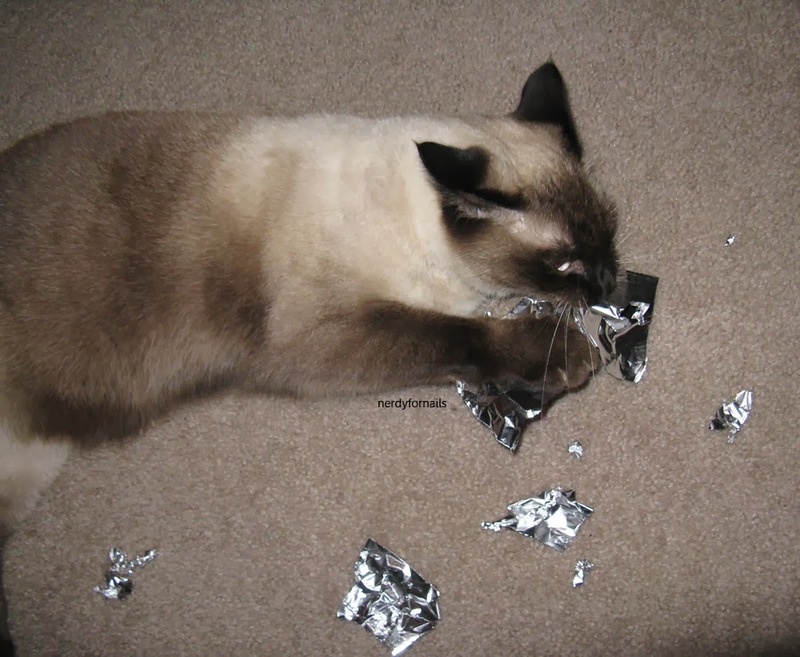 Here he is helping me tear foil into strips for the foil method of glitter polish removal. Awwww. So helpful. How do you organize your polish and where do you do your painting? If you have pictures send me links. I'd love to see! 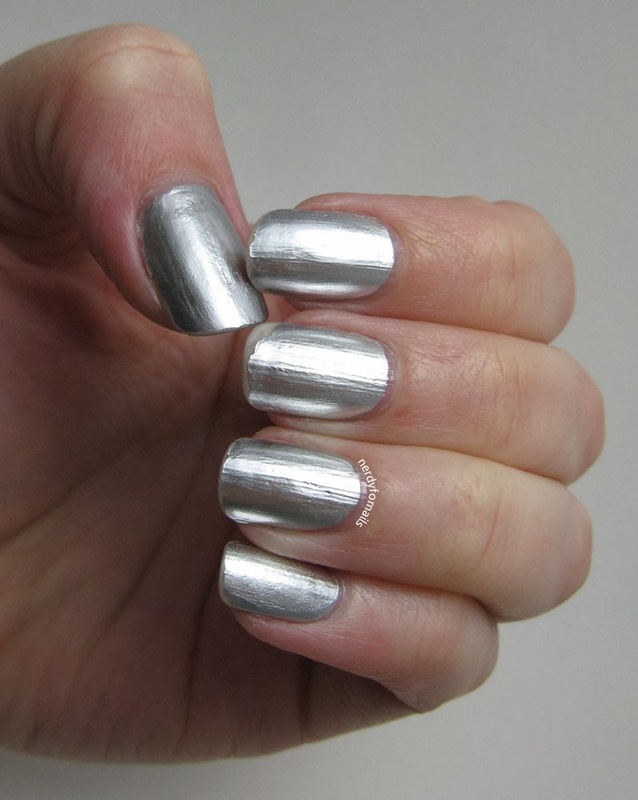 After I posted my review of OPI's Push and Shove I heard a rumor that Lay Down That Base, the base coat that comes with the polish will turn any metallic polish into an ultra-chrome so I had to try it out. 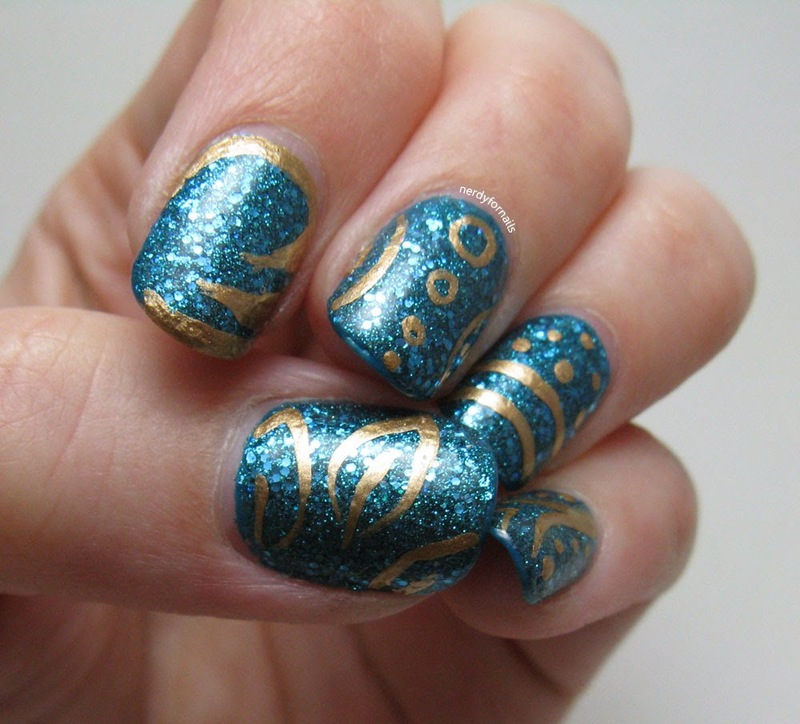 I picked out a few metallic polishes, painted on a coat of Lay Down That Base and took a few photos. It looked chromey enough, but I didn't have anything to compare it with. I took off all the polish, put on my regular base coat and polished all the nails again to get my control group. Let me just say that it's really hard to do the same hand pose half an hour apart to get an accurate comparison. I have a renewed admiration for ladies like Sarah at Chalkboard Nails who somehow manages to nail the exact same hand pose in every picture. I'm not sure that the difference was big enough to support the claim that Lay Down That Base can make a metallic into an ultra-chrome. Take a look and see if you can tell which is which. The top picture is with the special base and the bottom is my regular base coat. Both pictures show two coats of polish. 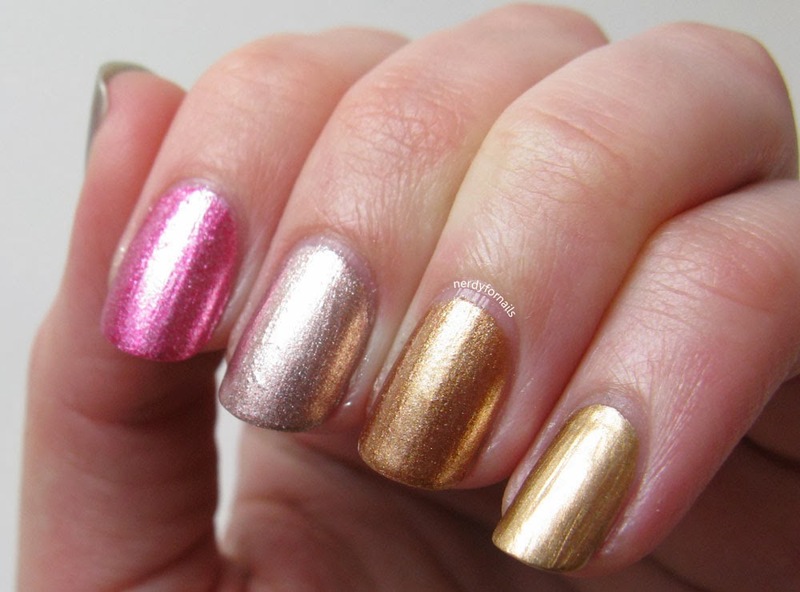 From index to pinkie I used: LA Colors- Dazzle, Orly- Rage, Zoya- Richelle and Maybelline Color Show- Bold Gold. 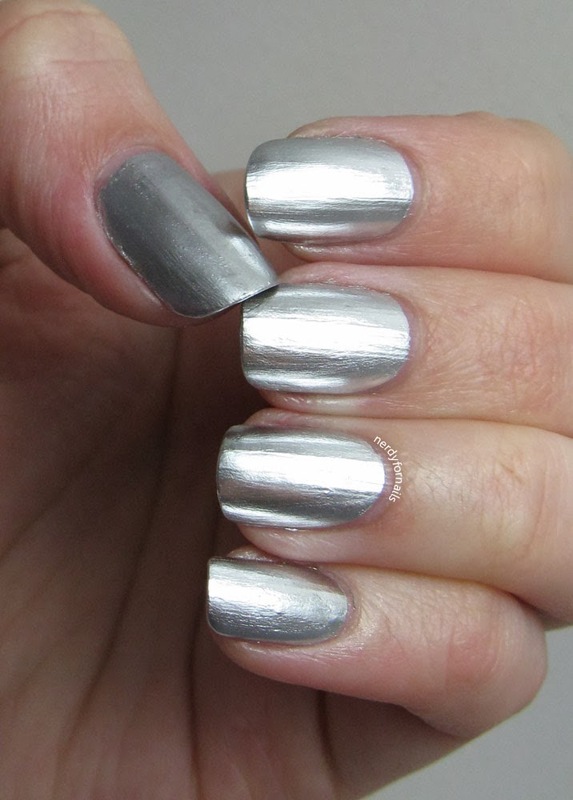 One thing to note is that the first three polishes might be too foil-like for this experiment. 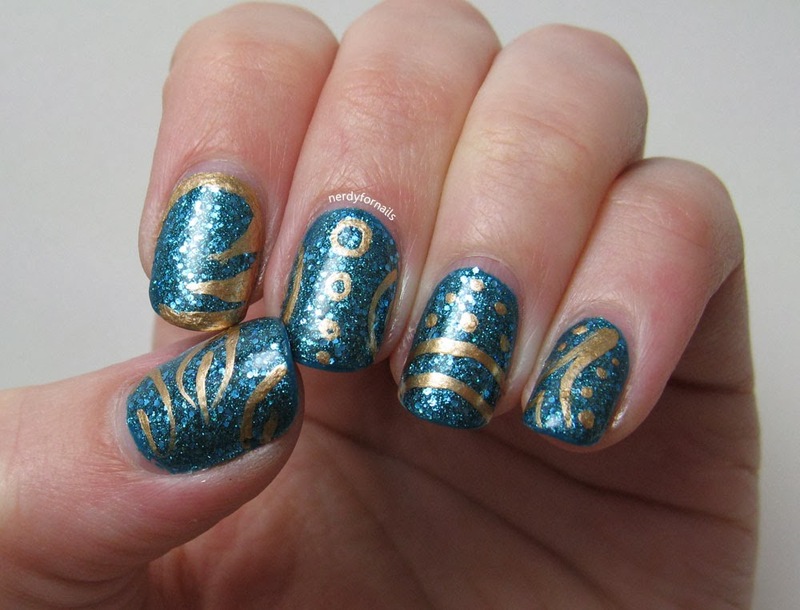 Bold Gold was the smoothest and actually applied the most like Push and Shove. 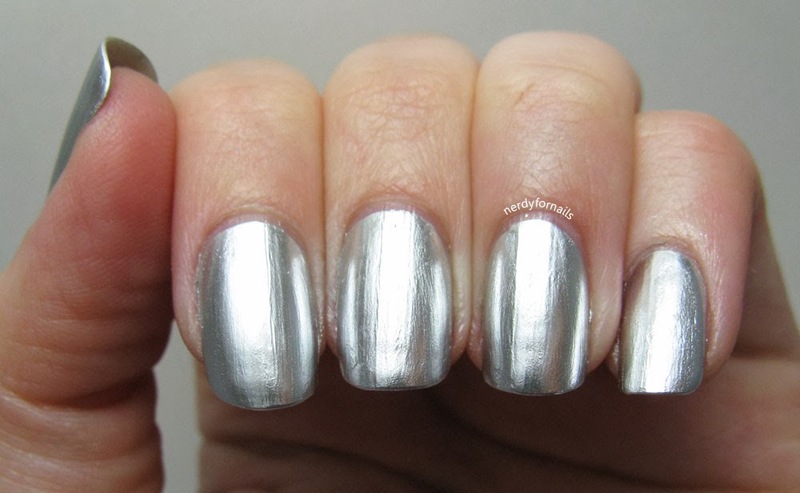 My overall opinion is that Lay Down That Base may have added a little extra shine and smoothed out a few more imperfections on my nails, but it wasn't a big enough difference from regular base coat for me to say that it made the polishes ultra-chrome. 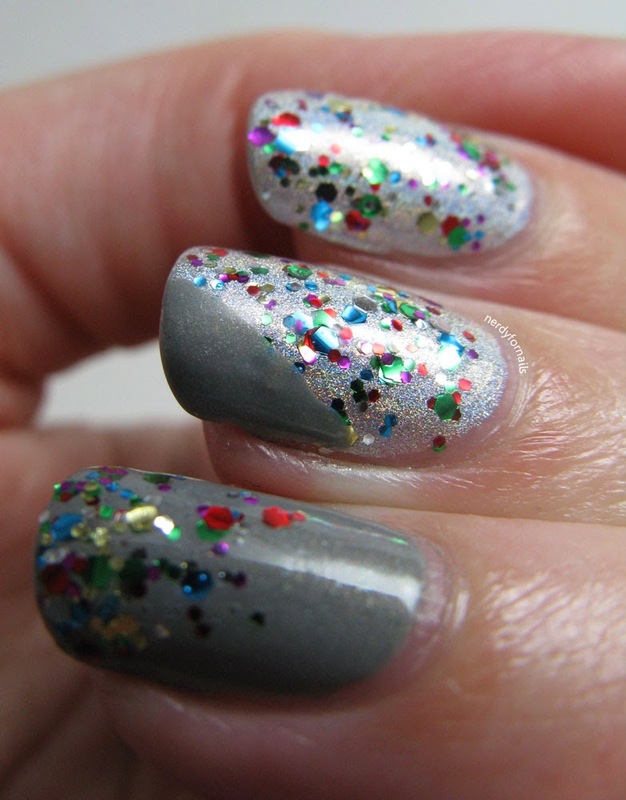 I'm back today with more love for Orly and some little nubs (well, for me anyway). I have to laugh when I say that because they still look long, but I cut so much off. They were starting to get little tears at the edges and I knew this week would be rough at work so I didn't want to tempt fate. If I can make it to Memorial Day it will officially be a year with no breaks. I get really amused the first day after trimming when I'm able to use my index finger like a stylus on my iPad instead of having to flat-finger it like usual. #longnailproblems?? I've got on two coats of Orly's You're Blushing. I love this shade because I can't decide if it's more purple or pink and it has just a hint of grey. It may be my perfect neutral- just different enough that it could never be boring while still being perfectly classic. 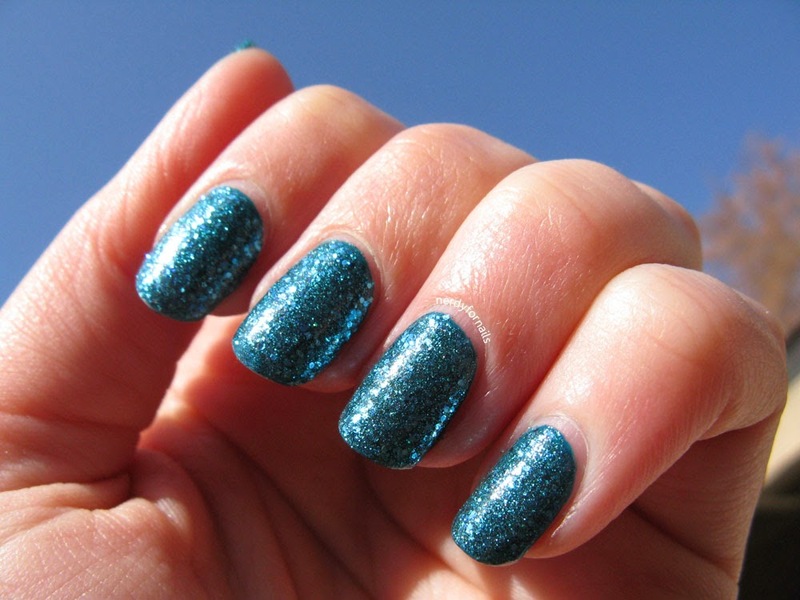 In my review post yesterday I mentioned that I've had a polish in my stash for twelve years that rivals the finish of OPI's new polish Push and Shove from the Gwen Stefani collection. 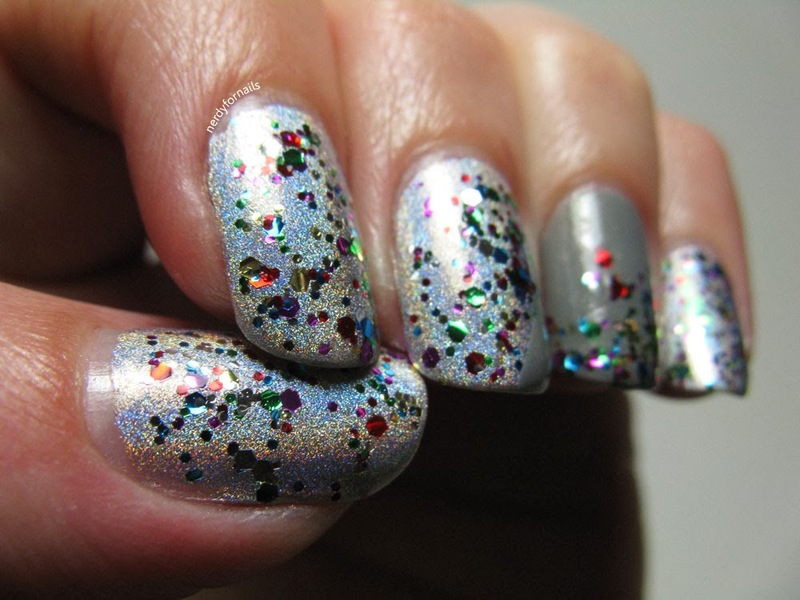 I bought this polish back in 2001 while I was out shopping with my roommate during our freshman year of college. Yeah, feeling kind of old right about now. I think it was around $6. I remember it being a splurge then too. Apparently my cheapness spans decades. 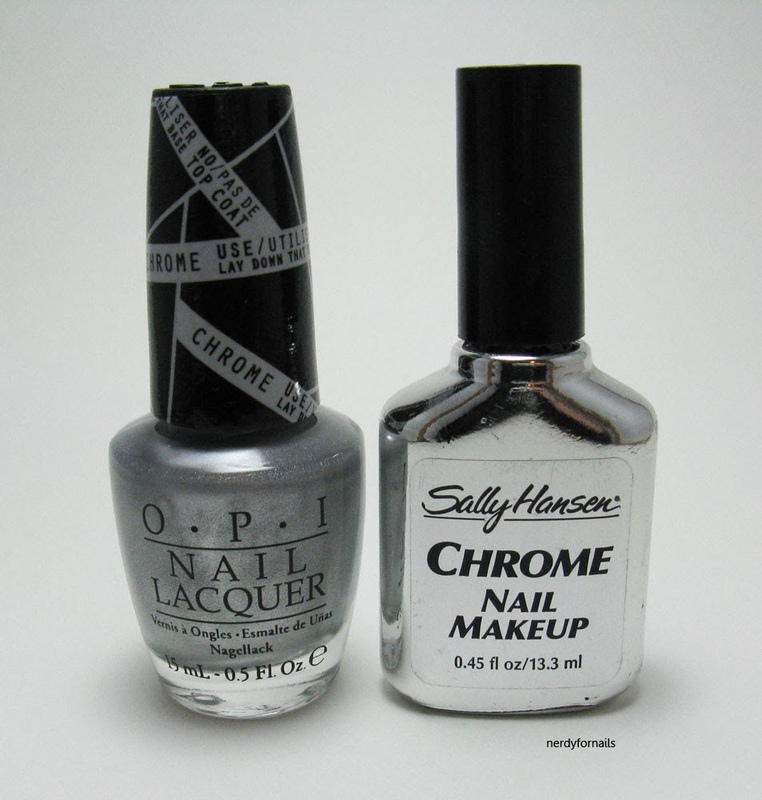 The polish is Sally Hansen Chrome Nail Makeup in Pure Chrome. It came in all sorts of colors- check out this Google search. I wish I could go back in time and buy all of them. Now to see how the two polishes compare. I did this on my off hand so please forgive the terrible clean up. I wasn't actually intending on showing it until I saw how close the colors were- almost identical really. The only difference I could see was that the OPI was slightly brighter in the light and the brush strokes showed just a bit more with the Sally Hansen. From a distance you really couldn't tell at all though. The wear was about the same for both polishes after three days as well. I love finding hidden gems in my own collection. 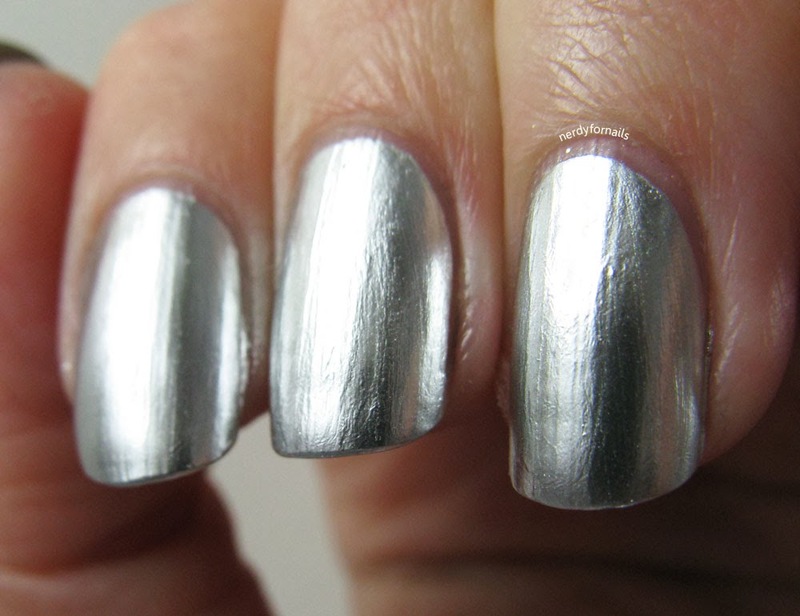 I've always loved this polish, but now I think I appreciate it just a little more knowing it was so far ahead of its time. 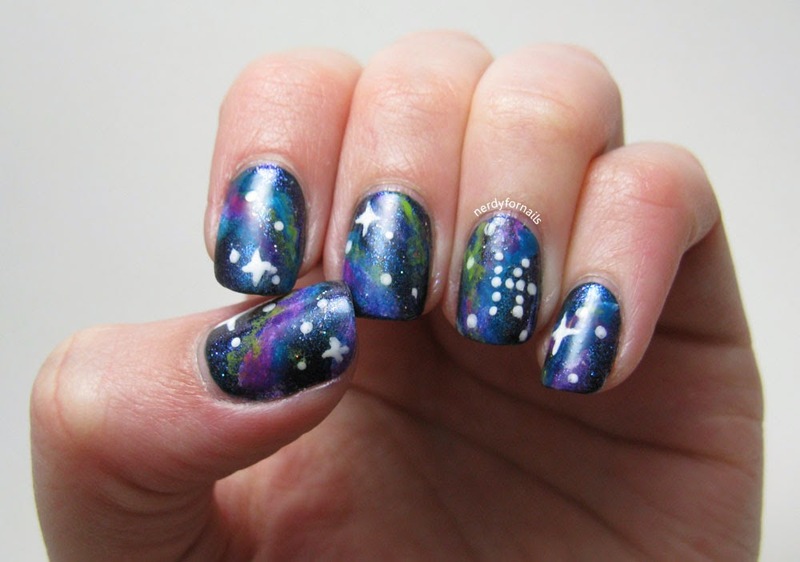 Do you have any polishes like that hidden away? 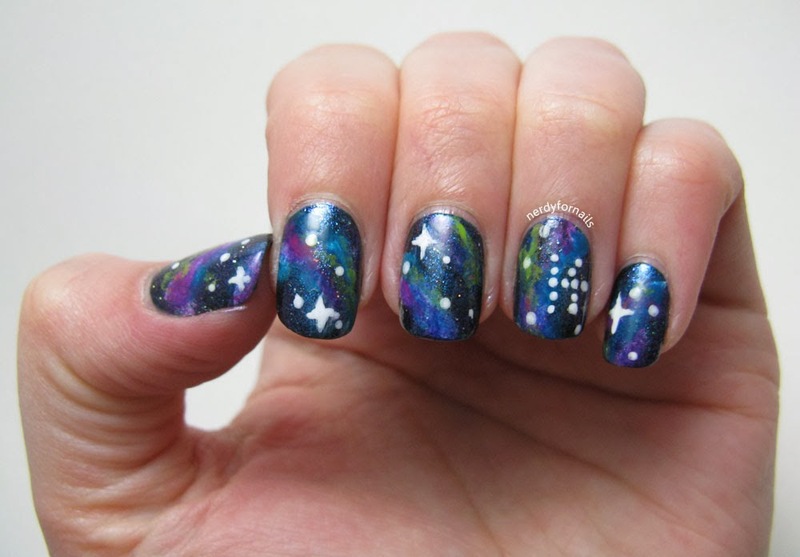 This is a pretty momentous occasion here at Nerdy for Nails. I may be one of the cheapest bloggers around. I rarely buy something from a current collection because they end up on clearance so quickly and then I can afford twice as many. I also didn't own a single OPI up until now because I always seem to have a $2 bottle in a similar color so I can't justify their prices. 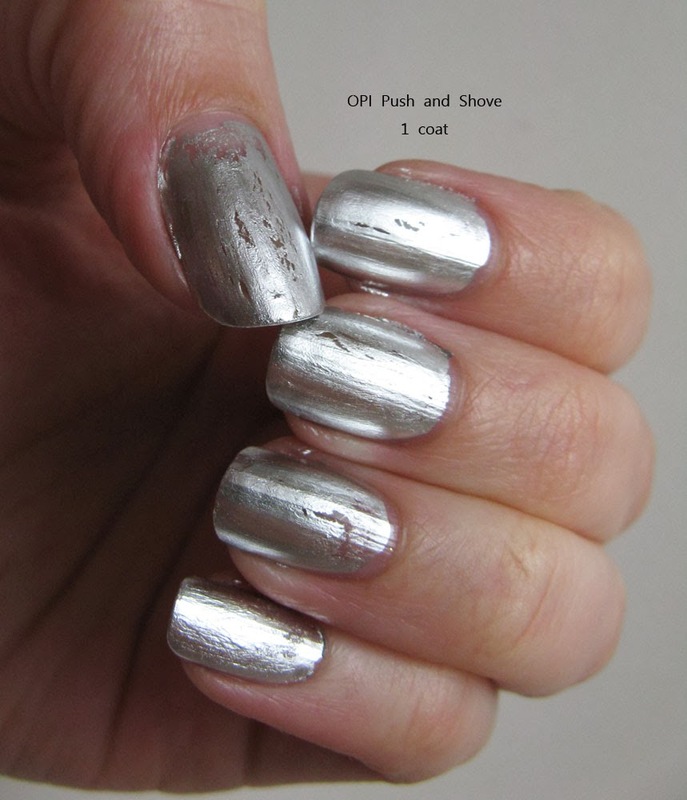 Push and Shove from OPI's Gwen Stefani collection is the polish that changed my mind. The swatches were gorgeous... and I had a gift card. As it turns out I did, indeed, have a cheaper version of this already in my collection, but I regret nothing. 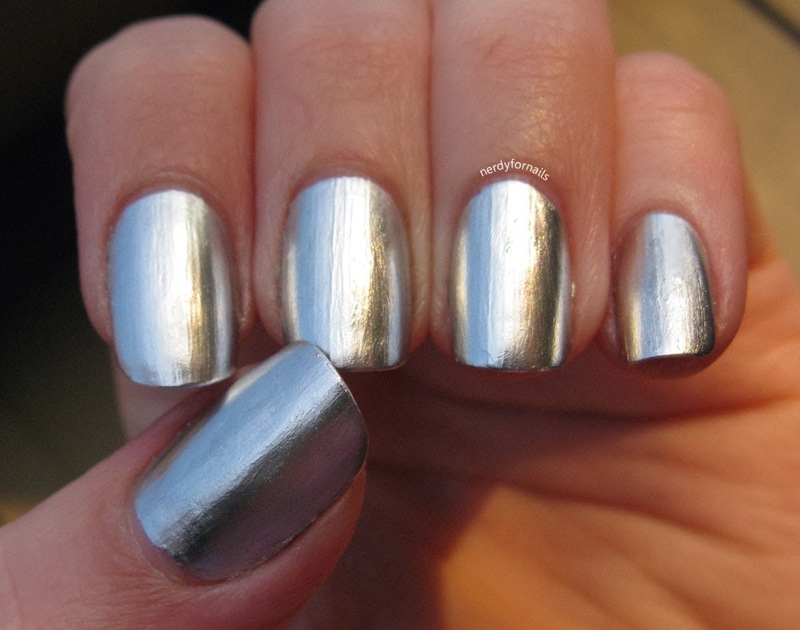 It's a beautiful polish despite its attitude. Read on for my full review and check back tomorrow to find out what mysterious 12 year old polish gives Push and Shove a run for its money. The Push and Shove Duet Pack comes with Lay Down that Base. 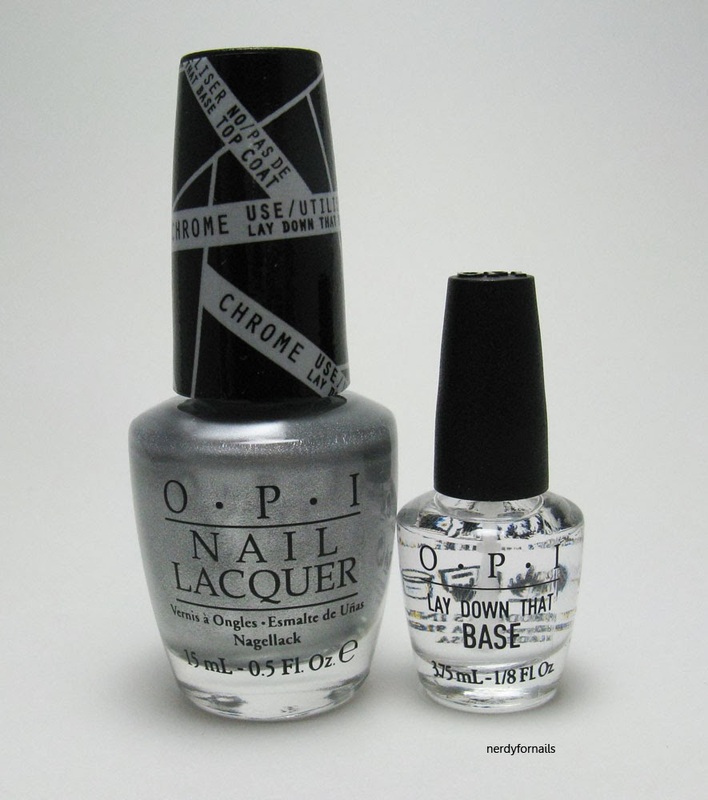 The base coat dries slightly rubbery and helps the chrome polish stick. I did a coat of my regular base first to help smooth out any imperfections in my nails. Coat #1: Is this a crackle polish or am I suddenly incompetent at painting my nails?? Thankfully the second coat evened out most of the crackles and flaws. Despite the instructions on the package that say to apply two thin coats, I added a third coat on a few nails that were still patchy. 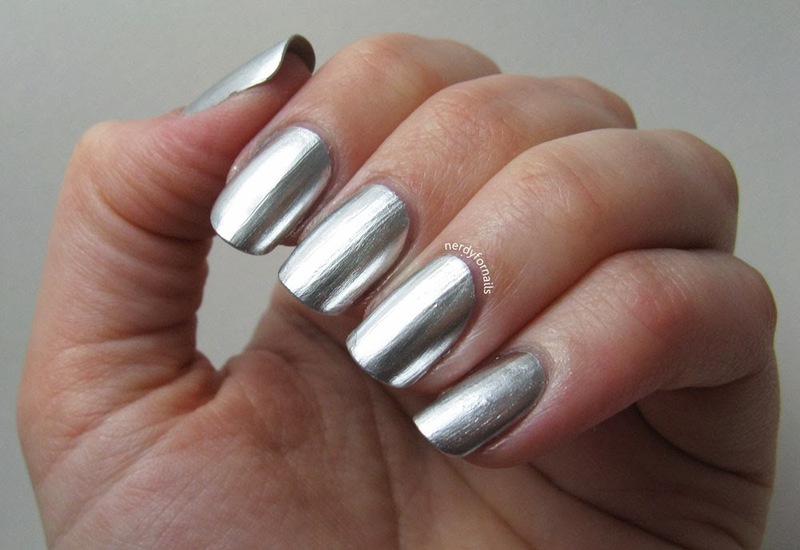 This ultra-chrome polish catches the light beautifully and looks almost like foil on your nails. The application is a bit more difficult than a normal polish because it dries quickly and pulls up the polish if you accidentally paint over a partially dried section. I found I needed to wipe more polish off the brush before painting than I normally would to keep the coats light enough. I also had to fight my instinct to go back and smooth out any thick patches. The results are certainly beautiful enough to forgive any difficulties with the application. 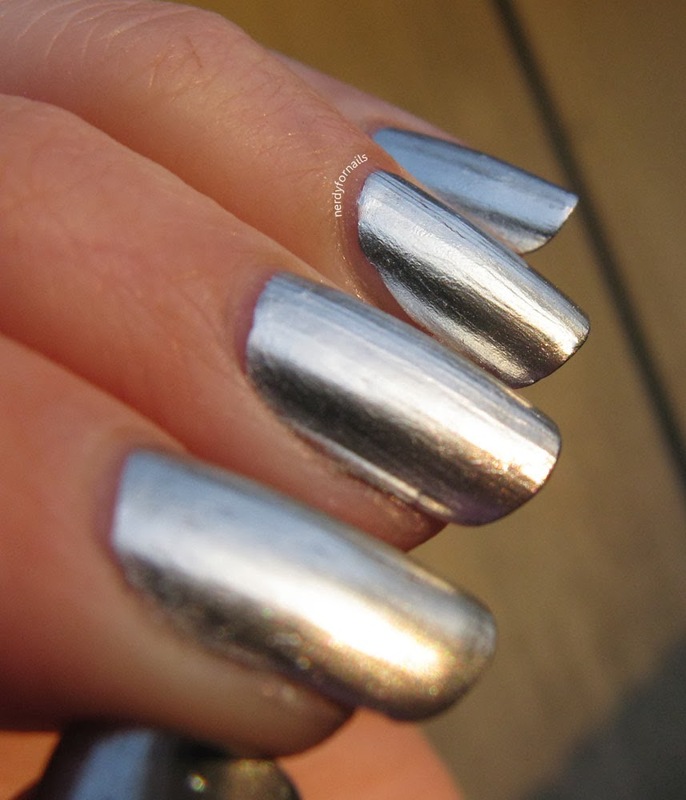 I got some shots outside in the sunlight that show just how shiny this polish is. And the question that was burning in my mind: how long will it last? The package itself says "Do not use top coat. Like all limited engagement events, Push and Shove is intended for One Night Only wear." I'm already getting good at ignoring instructions with this polish so of course I put on top coat. It didn't noticeably dull the finish which was great. I painted them on Saturday night and they looked great all through dinner with friends and baking cupcakes Sunday including washing dishes with no gloves (I really wanted to test it). I think I chipped the middle finger in the shower Monday morning at that started the worst for that nail. This picture was taken three days later on Tuesday night and as you can see there's the chipping on the middle finger and tip wear on the rest, but not nearly as bad as I expected. What do you think about this one? It was different enough for a mainstream polish that I had to try it. I know ultra-chromes have been around for a while on the indie scene but I haven't seen any on the mainstream side lately. I hope ultra-chrome will be the next big thing like texture. I want more in all the colors! Lately I've been all about Orly. The colors and formulas are great and they keep finding their way home with me even though I'm supposed to be on a budget. Luckily Sally Beauty Supply does a buy one get one free sale every month or so. It doesn't count if it's on sale! This shade is called Jealous, Much? I don't have to be any more since it's now alllll mine. I've somehow magically acquired seven new Orlys since December. Which shades are your favorite? If mine start to get lonely again they may need some new friends.